An unusual and interesting variety of bush, Euonymus phellomanus has unusual winged branches, fascinating fruits and good autumn foliage colour. This variety has long lasting and abundant bright pink four-lobed fruits that split to reveal bright orange seeds - a real clash of day glo colours just at a time when the garden is beginning to look bereft of brightness. The common name of Corktree gives a clue to another fascinating feature - corky wings on the branches. 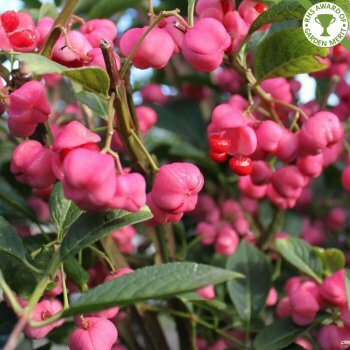 Euonymus phellomanus has the RHS Award of Garden Merit and is self fertile so only one plant is required for the vibrant ornamental fruits. A slow growing variety of Euonymus, the width will eventually exceed the height (2m height x 2.5m spread in 20 years). It is tolerant of drier soils and is happy in both full sun or part shade. This Spindle bush needs a bit of space to get established so avoid other plants swamping it and it will reward you throughout autumn and winter. Our pot grown Euonymus phellomanus can be planted at any time of the year. Choose a place where other plants won't swamp it, as it is relatively slow growing. Remove all weeds and grass within a metre of your desired planting hole, then dig a square hole as deep as your root mass and approximately 2x as wide. To help Spindle Trees establish more effectively, we advise sprinkling root grow in the hole, especially if you have poor soil. If you’re planting Euonymus in spring, summer or dry weather, water well and regularly for the first few months. Make sure to keep an eye on young Spindle trees and increase watering if there are extended periods of hot or dry weather. If you’re planting in autumn, you may only need to water your tree a little. Once planted, it is important to keep the area free of competing weeds and grass for the first couple of growing seasons. Spindle trees do not require regular pruning. If you wish to tidy up your Euonymus phellomanus tree, do this during the dormant season. Focus on removing any damaged, diseased or overcrowded branches. If you require a clear trunk, remove any side shoots to help raise the crown.